Should we rely on technology as a motivator for students? I found this blog post by Bill Ferriter posted on Twitter by @jennyluca, Are kids really motivated by technology? It got me thinking about the motivating factors (or not) of technology. 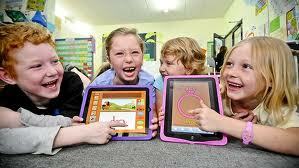 Quote from above article – “You can’t motivate students with technology because technology alone isn’t motivating”. While I’m not sure I entirely agree with this, for example playing Rocket Math on the iPad is more motivating for an 8 year old than trying to do the same math on a worksheet, I do agree with the sentiment of the statement. If we think we can rely on technology to make our classes more motivating without considering the impact of the technology on the learning then we are mistaken. A poorly planned lesson with a tablet/Web 2.0 is still a poorly planned lesson! Another quote from the article, which I entirely agree with is, “Basically what I’m arguing is that finding ways to motivate students in our classrooms shouldn’t start with conversations about technology. Instead, it should start with conversations about our kids. What are they deeply moved by? What are they most interested in? What would surprise them? Challenge them? Leave them wondering? Once you have the answers to these questions — only after you have the answers to these questions — are you ready to make choices about the kinds of digital tools that are worth embracing”. For all the technology I have integrated into my classes over the past 12 or so months, at the start at least, I expected the technology to be motivating in itself. Particularly when starting out using a new technology like blogs. I expected the students to be motivated because they were using a new technology, and to a point they were but if I designed a poor task or a task they had done many times before on paper or in a book they soon became non plussed with the fact it was on a blog. In hindsight the technology was more motivating for me than it was the students. Mobile and online technologies are only a tool, they are not the end point or the major focus of our planning and teaching. Student learning should hold this position, our programming, pedagogy and assessment should be foremost in our minds. Web applications and iPads/Tablets are just tools to help us to achieve these outcomes more efficiently and more effectively. This entry was posted in Change, Pedagogy, Professional Learning, Technology and tagged iPad, mobile learning, pedagogy, teacher tool, technology. ← How learning has changed? How should we teach? Absolutely agree with you. Michael Fullan identifies technology as me of the wrong drivers of educational change, system improvement. He argues quality instruction, pedagogy over technology. Technology is a tool as you identify and the great risk is we limit it’s potential without using an effective learning design / pedagogical framework. Denise has probably got an article linked to Fullan’s work, I’ll try to send an email link. Thanks for the comment Rog. I would be interested to have a read. I agree also Nick. I am still at the stage where I get excited by new technology, but what gives me a buzz, (the challenge of mastering a new skill or learning something new) does not necessarily inspire or motivate students. Also the age of students plays a large role – I found a great web site which allowed students to perform a heart transplant (we were studying the heart in Science). I used the IWB to show the site, but could not get any of the year 9 group to come out to the front to demonstrate. I am now going to give them a link to the website so that when we are in the computer suite next, they can try it but without an audience.